In this article we will look at how more than one PIR sensor can be connected together to give one cumulative output signal which can be used to control a single relay, alarm, or a single input on amicrocontroller. For this example we will use the excellent Honeywell IS-215T 12 Volt DC PIR sensor (pictured below and available in the REUK Shop). A typical domestic PIR sensor contains within it NC and COM contacts. “NC” stands for normal closed. This means that while the PIR sensor is not detecting motion, NC and COM are shorted – i.e. there is an electrical connection between them. A signal voltage is connected to one of these terminals, and out of the other comes either the signal voltage (when motion is not being detected), or nothing at all (when motion IS being detected and the NC/COM connection is broken). 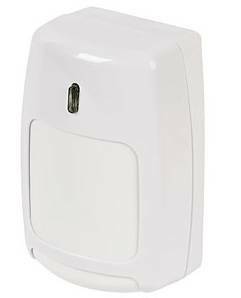 This output from the PIR sensor can be connected to an burglar alarm system, or used to switch a relay which can in turn control any device. We sell a standard PIR relay timer board which can be used to keep lights on for a user-programmable time period after motion is detected by a single PIR sensor. We also have a double PIR relay timer board which monitors two separate PIR sensors to control a single relay. But what if you have three, or four, or ten PIR sensors scattered around which all need to be fed into one monitoring device to trigger an alarm or close a relay when motion is detected by any of the PIR sensors? Fortunately, since PIR sensors have NC and COM contacts, it is possible to connect any number of them together in series to generate a single cumulative output signal which will be high (signal voltage) when motion is not being detected and low when motion IS detected – i.e. the cumulative signal will act just like the signal from a single PIR sensor. The schematic above shows how three Honeywell PIR sensors can be connected together in series. 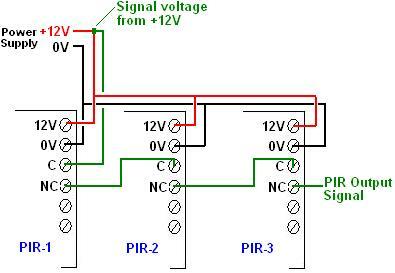 The signal voltage goes into the C (COM) of the first PIR and comes out of NC and on to the C of the second PIR and out of the NC to the C of the third PIR and then finally out of the NC of the third PIR sensor. If any or all of the PIR sensors in this string detect motion, the signal voltage taken from the power supply will not come out of the last PIR sensor exactly as required. Any number of PIR sensors can be connected together in this style.